Mid to late fall brings the first frosts for many gardeners, when growth slows and the season officially draws to a close. But lots of crops will carry on a while longer if they’re given a little protection. 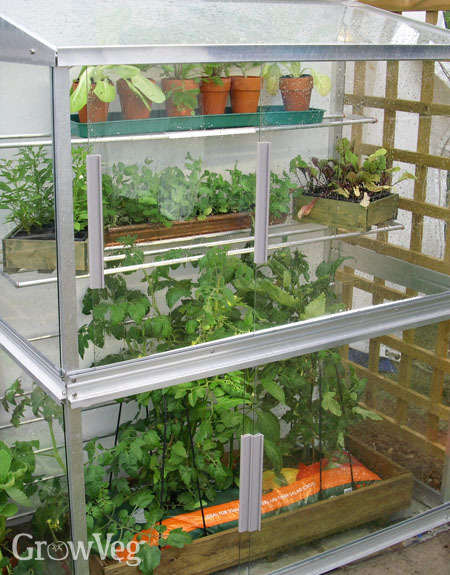 Use row covers, low tunnels and cold frames to offer that all-important additional warmth and shelter. Summer salads and tender plants such as cucumbers, peppers and tomatoes will continue to ripen so long as they’re protected from frost, enabling late starters to play catch up and yield a tasty harvest. Sheltered, sun-facing walls also have the effect of creating a warm microclimate that can extend these summer favorites well into fall. When the warm weather crops are done, it’s the turn of hardy cool-season staples that were sown in summer. You may be surprised as what will grow throughout the winter: salads such as mizuna, tatsoi, endive, winter lettuce and mustards; leafy greens including chard, spinach, and the every-ready kale; plus all manner of overwintered carrots, parsnip, beets and leeks. The springtime ‘hungry gap’ – when the previous season’s crops are finished but the current season’s aren’t yet ready – can mean scant harvests. But careful planning can insure there’s plenty to enjoy during this traditionally lean time. Sow vegetables such as broccoli, cabbage and late-season leeks in late summer to stand over winter and join the last of the winter-stored produce such as squashes to keep the kitchen supplied. Onions, chard and peas may be sown into plug trays from late winter to transplant into beds from early spring. Others can be given a head start by pre-warming the soil with row covers or cloches. Sowings can be made directly into this pre-warmed soil two to three weeks sooner than in unprotected ground. Then from early spring it’s the turn of tender crops such as tomatoes and eggplant. Keep on sowing quick-maturing varieties little and often throughout the spring and summer to ensure a steady succession of harvests. Choose a mixture of varieties covering early, mid and late-season harvesting to maximize how long you can enjoy each vegetable. This way you could be enjoying carrots from mid spring to late winter, or strawberries from early summer, right through to fall. When the first crops of the growing season are done, don’t hang about – sow or plant a succession crop! Planted from midsummer onwards, succession crops include many autumn and winter-maturing vegetables, including those suitable for storage such as maincrop carrots and celeriac, plus quick-growing favorites like bulb fennel and bush beans, which will be ready before the first frosts in many areas. Any year-round productive garden needs careful planning. Our Garden Planner has a number of powerful features to help you really maximize your space and your time.